She has 10 double passes to give to members to attend the preview screening on Monday 4th August at Event Cinemas, George St, Sydney. A message from the ANC organiser, Marcia Scudder. As an added touch, you can mix your bridge session with horse racing on the track outside at fun Congress events running on both Wednesdays, the 16th and 23rd July. These events are designed to allow you to watch each race from the grandstand and maybe even have a flutter. Entries received and fully paid by 30th June for the Open and Women's Butler Stage 1 will receive a discount of $25 per pair. 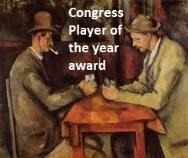 "What happens most often at the bridge table? ".